Second Spring Exhibition of OBMOKhU, Moscow, May-June 1921. Constructions by Alexander Rodchenko, Konstantin Medunetsky, Karl Ioganson, Georgii Stenberg and Vladimir Stenberg; two have been preserved: Medunetsky's Spatial Construction and Rodchenko's Oval Hanging Spatial Construction no. 12. A timeline of constructivism from Bann 1974: xviii. 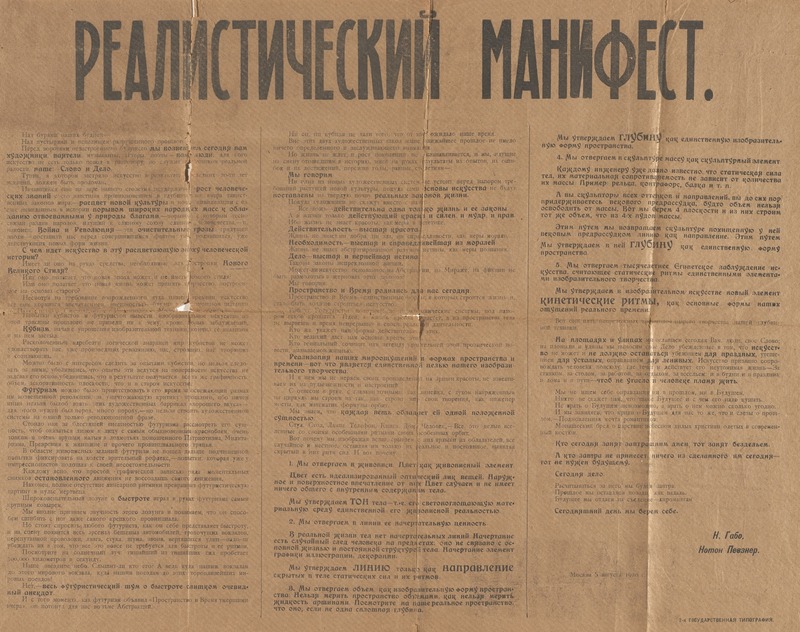 A resource on constructivism, focusing primarily on the movement in Russia and east-central Europe from the late 1910s through the 1930s. The page contains an overview of major exhibitions and catalogues, selection of works, list of (digitised) magazines, pamphlets and books, anthologies of texts (also merged into a single table), historical studies and analyses, and profiles of artists, theorists and groups. First published 25 September 2015. Some of the catalogues are available online, follow PDF links in captions. Naum Gabo, Constructed Head No. 2, c1916. Galvanised iron painted yellow ochre. 45x40.5x40.5 cm. Tate. More works in the series. Lyubov Popova, Painterly Architectonic, 1917. Oil on canvas, 80x98 cm. MoMA. More works in the series. Alexander Rodchenko, Spatial Construction No. 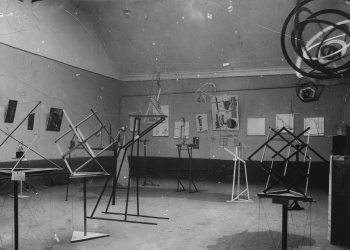 5 from his First Series of Spatial Constructions, 1918. Painted aluminum. 48x38x21 cm. More works in the series. Konstantin Medunetsky, Spatial Construction (Construction no. 557), 1919. Tin, brass, painted iron, and steel. 46x18x18 cm (with base). Yale. More works. Alexander Rodchenko, "Ellipse" from his Second Series of Spatial Constructions, 1920-21. Plywood, open construction partially painted with aluminum paint, and wire. 61x84x47 cm. MoMA. More works in the series. Karl Ioganson, Spatial Constructions, 1920-21. Wood, metal, and wire. Dimensions unknown. More works. Georgii Stenberg, Spatial Construction KPS 58 N XIII, 1921. More works. Vladimir Tatlin, model for the Monument to the Third International, 1920. More images. Gustav Klutsis, Hanging Construction, 1921. Photograph, 20,1x25,6 cm, printed from Klutsis's negative. Costakis. More works. 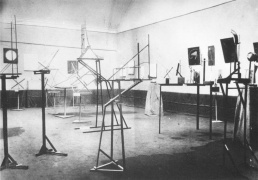 Katarzyna Kobro, Suspended Construction (1), 1921. Epoxy resine, fiberglass, wood, metal. 20x40x40 cm. Reconstruction by B. Utkin and J. Utkin, 1972. More works. Mieczysław Szczuka, Spatial Construction—Portrait of a Revolutionary, 1922. Metal, wood. Łódź. More works. Lajos Kassák, Bildarchitektur II (Entwurf eines Kiosks), 1922. Gouache, cardboard. More works. Lyubov Popova, Alexander Vesnin, photograph of the maquette of "City of the Future" for the mass festival Struggle and Victory of the Soviets, 1921. Costakis. More images. Lyubov Popova, poster with a model of stage set for Magnanimous Cuckold, directed by Vsevolod Meyerhold, 1922. More images. Varvara Stepanova, stage set for Tarelkin's Death, directed by Vsevolod Meyerhold, 1922. More images. Alexander Vesnin, model for the set for The Man Who Was Thursday, directed by Alexander Tairov, 1923. Varvara Stepanova, Designs for sports clothing, 1923. More works. Karel Teige, design for Vítězslav Nezval's poetry book Abeceda, 1926. Full book. Yakov Chernikhov, A Special-Purpose Giant Plant, 1931. More works. Władysław Strzemiński, Design of alphabet, 1932. Aelita, Queen of Mars, dir. Iakov Protozanov, 1924. Based on the novel by Alexei Tolstoy (1923). Interplanetary Revolution, dir. N. Khodataev, Z. Komisarenko, and Y. Merkulov, 1924. Animated film. Gabo, Pevsner, Realisticheskii manifest, 1920. 59x74 cm. Punin, Pamyatnik III internatsionala, 1920. 28x20 cm. Ginzburg, Stil' i epokha, 1924. Chernikhov, Konstruktsiya arkhitekturnykh i mashinnykh form, 1931. Martin, Nicholson, Gabo (eds. 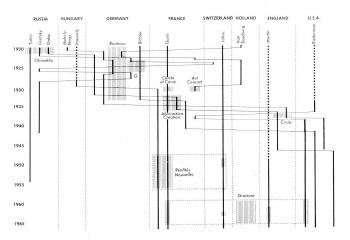 ), Circle: International Survey of Constructive Art, 1937. Stephen Bann (ed. 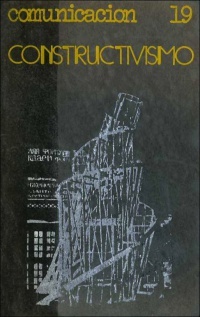 ), The Tradition of Constructivism, ed. 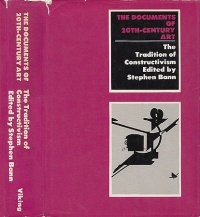 Stephen Bann, 1974, Log, PDF. A collection of texts from selected English-language anthologies (ToC = Bann 1974, RAA = Bowlt 1976, AiT = Harrison & Wood 1992, BW = Benson & Forgács 2002, LoR = Tsivian 2004). Links in the fourth column lead to versions of the texts as they appear in the anthologies, together with editorial introductions. The last column represents themes. Most of the columns are sortable. Bau = The Bauhaus; Ber = Berlin; Buc = Bucharest; CIPA = statements from and reaction to the Congress of International Progressive Artists, Düsseldorf; Circ = Circle; ExVie = Exile Vienna; Lju = Ljubljana; Pol = Poland; Prag = Prague; Ru = Russia; RuCi = Russian cinema; RuExh = First Russian Exhibition in Berlin; Str = Structure; Yu = Zagreb/Belgrade. See also catalogues of retrospective exhibitions, introductions and commentaries to translations of primary books, introductions in anthologies and readers, and bibliographies on pages of respective artists, groups and theorists. N.A. Nikonov (В.А. Никонов), Staty o konstruktivistakh [Статьи о конструктивистах], Ulyanovsk: Strezhen, 1928, 102 pp. Tekhnicheskaia estetika (Trudy VNIITE) [Technical Aesthetics (Transactions of the VNIITE], Moscow: Dept of the History and Theory of Design/VNIITE, 1964-92. Journal. Selected numbers from 1986-92. S.O. Khan-Magomedov (С.О. Хан-Магомедов), INKhUK i ranniy konstruktivizm [ИНХУК и ранний конструктивизм: научное издание], Moscow: Architectura, 1994, 248 pp. E.V. Sidorina (Е.В. Сидорина), Russkiy konstruktivizm: idei, istoki, praktika [Русский конструктивизм: Идеи, истоки, практика], Moscow: n.p., 1995, 240 pp. G.V. Titova (Г.В. Титова), Tvorcheskiy teatr i teatralnyy konstruktivizm [Творческий театр и театральный конструкти­визм], St Petersburg: St Petersburg Academy of Theatrical Arts, 1995, 255 pp. Alexander Lavrentiev, Laboratoriia konstruktivizma, Moscow: Grant, 2000. O.V. Akhmatova, Russkii konstruktivizm (opyt sotsial'no-filosofskogo analiza), Moscow: Sputnik, 2001. Mariya Zalambani (Мария Заламбани), Iskusstvo v proizvodstve: avangard i revolyutsiya v Sovetskoy Rossii 20-kh godov [Искусство в производстве: Авангард и революция в Советской России 20-х годов] , trans. N.B. Kardanov (Н.Б.Карданов), Moscow: IMLI RAN, 2003, 240 pp. S.O. Khan-Magomedov (С.О. Хан-Магомедов), Konstruktivizm. Kontseptsiya formoobrazovaniya [Конструктивизм — концепция формообразования], Moscow: Stroyizdat [Стройиздат], 2003, 576 pp. TOC. S.O. Khan-Magomedov (С.О. Хан-Магомедов), Aleksandr Vesnin i konstruktivizm. Zhivopis', teatr, arkhitektura, risunok, knizhnaia grafika, oformlenie prazdnikov [Александр Веснин и конструктивизм], Moscow: Architectura, 2007, 412 pp. E.V. Barkhatova (Е.В. Бархатова), "Russkiy konstrukivizm 1920-kh - 1930-kh godov" [Русский конструктивизм 1920-х - 1930-х годов], nlr.ru (Russian National Library), 2010. E.V. Sidorina (Е.В. Сидорина), Konstruktivizm bez beregov. Issledovaniya i etydy o russkom avangarde [Конструктивизм без берегов. Исследования и этюды о русском авангарде], Moscow: Progress-Traditsiya, 2012, 656 pp. George Rickey, Constructivism: Origins and Evolution, New York: G. Braziller, 1967, xi+306 pp; rev.ed., 1995, xi+306 pp. Willy Rotzler, Constructive Concepts: A History of Constructive Art from Cubism to the Present, London: Academy Editions, 1977, 299 pp. Margit Rowell, "New Insights into Soviet Constructivism: Painting, Constructions, Production Art", in Art of the Avant-Garde in Russia: Selections from the George Costakis Collection, New York: Solomon R. Guggenheim Museum, 1981, pp 15-32. "The Inkhuk and Constructivism", in Art of the Avant-Garde in Russia: Selections from the George Costakis Collection, New York: Solomon R. Guggenheim Museum, 1981, pp 198-258. Catalogue of works. Christina Lodder, Russian Constructivism, Yale University Press, 1983, viii+328 pp. Reviews: Willett (LRB 1984), Mudrak (AB 1987). S.O. Khan-Magomedov, Alexander Vesnin and Russian Constructivism, New York: Rizzoli, 1986. Patricia Railing, From Science to Systems of Art: on Russian Abstract Art and Language 1910/1920, and Other Essays, Artists Bookworks, 1989, 154 pp. . Review: Stupples (NZSJ 1991). Briony Fer, "Metaphor and Modernity: Russian Constructivism", Oxford Art Journal 12:1 (1989), pp 14-30. Art Into Life: Russian Constructivism, 1914-1932, eds. & intro. Richard Andrews and Milena Kalinovska, New York: Rizzoli, 1990, 276 pp. TOC. On the occasion of a travelling exhibition. Essays by Strigalev, Khan-Magomedov, Lodder, Senkevitch Jr., Bann, Andel, Foster. Christina Lodder, "The Transition to Constructivism", in The Great Utopia: The Russian and Soviet Avant-Garde, 1915-1932, New York: Solomon R. Guggenheim Museum, 1992, pp 266-281. Hubertus Gassner, "The Constructivists. Modernism on the Way to Modernization", in The Great Utopia: The Russian and Soviet Avant-Garde, 1915-1932, New York: Solomon R. Guggenheim Museum, 1992, pp 298-319. Briony Fer, "The Language of Construction", ch 2 in Fer, Batchelor, Wood, Realism, Rationalism, Surrealism: Art Between the Wars, Yale University Press, 1993, pp 87-169. Roann Barris, "Russian Constructivist Architecture as an Urban Carnival: The Creation and Reception of a Utopian Narrative", Utopian Studies 10:1 (1999), pp 42-67. Christina Kiaer, "The Russian Constructivist Flapper Dress", Critical Inquiry 28(1): "Things" (Autumn 2001), pp 185-243. Eva Forgacs, "Between Cultures: Hungarian Concepts of Constructivism", in Central European Avant-Gardes: Exchange and Transformation, 1910-1930, ed. Timothy O. Benson, MIT Press/Los Angeles: Los Angeles County Museum of Art, 2002, pp 146-164. Christina Lodder, "Art into Life: International Constructivism in Central and Eastern Europe", in Central European Avant-Gardes: Exchange and Transformation, 1910-1930, ed. Timothy O. Benson, MIT Press/Los Angeles: Los Angeles County Museum of Art, 2002, pp 172-198. Barrett Watten, The Constructivist Moment: From Material Text to Cultural Poetics, Wesleyan University Press, 2003. Maria Gough, The Artist as Producer: Russian Constructivism in Revolution, University of California Press, 2005, xi+257 pp. Reviews: Wood (AJ 2006), Douglas (MM 2006), Valkenier (RR 2006), Railing (SR 2007), Greenfield (SEEJ 2007), Barris (SECACr 2007). Christina Lodder, Constructive Strands in Russian Art, London: Pindar Press, 2005, ix+589 pp. Collected essays by the author. TOC. Christina Kiaer, Imagine No Possessions: The Socialist Objects of Russian Constructivism, MIT Press, 2005, xvii+326 pp. TOC, . Reviews: Wood (AJ 2006), Doy (AB 2006), Aulich (SR 2007), Reid (JDH 2007), Bader (AH 2008), Apkarian (RR 2008), Nieslony (Sehepunkte 2008), Nguyen (RJC 2014). Kristin Romberg, Aleksei Gan's Constructivism, 1917-1928, New York: Columbia University, 2010, 576 pp. Ph.D. Dissertation. Christine Schick, Russian Constructivist Theory and Practice in the Visual and Verbal Forms of "Pro Eto", Berkeley: University of California, 2011, 178 pp. Dissertation. "Illusions Killed by Life": Afterlives of (Soviet) Constructivism, Princeton University, 2013. Conference proceedings. 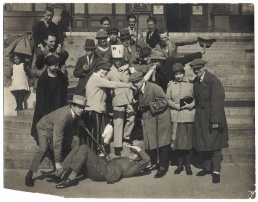 Roann Barris, "The Life of the Constructivist Theatrical Object", Theatre Journal 65:1 (March 2013). Kamila Kuc, Visions of Avant-Garde Film: Polish Cinematic Experiments from Expressionism to Constructivism, Indiana: Indiana University Press, 2016. Catherine Walworth, Soviet Salvage: Imperial Debris, Revolutionary Reuse, and Russian Constructivism, Pennsylvania State University Press, 2017, 231 pp. Willy Rotzler, Konstruktive Konzepte: eine Geschichte der konstruktiven Kunst vom Kubismus bis heute, Zurich: ABC, 1977, 299 pp; new ed., 1988, 332 pp; 3rd ed., 1995, 332 pp. Rainer Georg Grübel, Russischer Konstruktivismus. Künstlerische Konzeptionen, literarische Theorie und kultureller Kontext, Wiesbaden: Otto Harrassowitz, 1981, 263 pp. Excerpt, . Lothar Lang, Konstruktivismus und Buchkunst, Leipzig: Edition Leipzig, 1990, 208 pp. TOC. 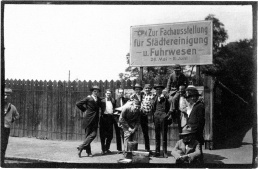 Kristina Passuth, Treffpunkte der Avantgarden: Ostmitteleuropa 1907–1930 , trans. Aniko Harmath, Dresden: Verlag der Kunst, 2003, 337 pp. (German) Review: Dmitrieva-Einhorn (H-Soz-Kult 2006). Andrzej Turowski, W kręgu konstruktiwizmu, Warsaw: Wydawnictwa Artystyczne i Filmowe, 1979, 288 pp. Andrzej Turowski, Konstruktywizm polski: próba rekonstrukcji nurtu, 1921-1934, Wroclaw: Zakład Narodowy im. Ossolińskich, 1981, 360 pp. Review: Gryglewicz (FHA 1985). Christina Lodder, El constructivismo ruso , trans. María Cóndor Orduña, Madrid: Alianza, 1988, viii+327 pp. Claude Leclanche-Boulé, Tipografías y fotomontajes: constructivismo en la URSS , trans. Rosa Vercher González, intro. Juan Manuel Bonet, Valencia: Campgràfic, 2003, 273 pp. Claude Leclanche-Boulé, Typographies et photomontages constructivistes en URSS, Paris: Papyrus, 1984, 173 pp; new ed. as Le constructivisme russe: typographies & photomontages, Paris: Flammarion, 1991, 173 pp. Kristina Passuth, Les avant-gardes de l'Europe Centrale, 1907-1927, Paris: Flammarion, 1988, 327 pp. Valerie Camden, L'influence du proletkult sur la théorie et la pratique constructivistes, Quebec: Université Laval, 2010, 147 pp. Dissertation. Gérard Conio, Dépassements constructivistes: Taraboukine, Axionov, Eisenstein, Lausanne: L'Âge d'homme, 2011, 396 pp. TOC. Kristina Passuth, Avantgarde kapcsolatok Prágától Bukarestig 1907-1930 , Budapest: Balassi, 1998, 381 pp. Victor Margolin, Ütopya mücadelesi: Rodchenko, Lissitzky, Moholy-Nagy, 1917-1946 , trans. M. Emir Uslu, Istanbul: Espas Sanat Kuram Yayınları, 2012, 286 pp. Maria Zalambani, L'arte nella produzione: avanguardia e rivoluzione nella Russia sovietica degli anni '20, Ravenna: Longo, 1998, 258 pp. This page was last modified on 21 August 2018, at 10:55. This page has been accessed 64,911 times.